We've all seen them - cars driving down the road with "poor man's racing slicks", complete with radials showing. We usually assume that the driver cannot afford new tires and is risking a (very likely) hydroplane for economic reasons. That driver is not the target market for Discolor Tyre. Instead, the market is the driver who is just relatively oblivious to the signs of a tire wearing thin. Most do-it-yourself mechanics and auto nuts are familiar with the "quarter test" and with the "nub" indicators inside the tread of most tires sold today. We know that when tire tread gets above George's head in several grooves on the tire (4/32-inch), (use a penny and Lincoln's monument if you're too poor to have quarters), it's time to replace it. The little groove nub indicators will also be flat with the tread when replacement is needed. The majority of drivers don't actually know when the tire needs replacement, though, and instead rely on (and trust) their mechanic to tell them during normal maintenance visits. Given that many use "drive through" fast lane service at.. well, less than knowledgeable oil change establishments, we can see that thin tires is likely more than a common safety issue. 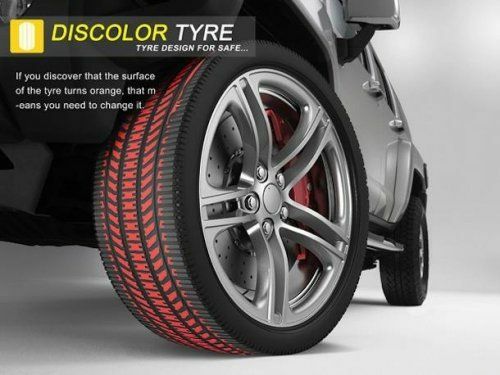 The idea behind Discolor Tyre is to create a coloration change in the tire itself when the tread is down to replacement depth. On most tires, this is somewhere between 12,500 and 20,000 miles. The tire design from Yanko Design causes orange-colored rubber to begin showing when tread wear is getting close to replacement requirements and the orange gets brighter as more of it is exposed due to wear. The orange layer of rubber is added just below the tread layer so that it is not-quite-visible under the traditional groove wear marks. When the tire is worn down to those marks, the orange will begin to show and as it gets more thin, the orange is more and more visible. This would have two consequences. First, the driver can easily see from the curb (or during a fill up at the station) that orange is beginning to show and thus a tire replacement is going to be required. Second, as the orange becomes more visible, it becomes an embarrassment that would likely prompt the driver to replace them sooner than he or she would otherwise. The conceptual design from Yanko is based on a 20,000 kilometer (12,400 mile) tread life tire, which is relatively typical in Europe. The concept could be applied to tires of any size or type and any life expectancy as well.